A replica of a 122-foot-long dinosaur is displayed at the American Museum of Natural History in New York. A STUDY THIS week proclaims a newly named species the heavyweight champion of all dinosaurs, making the scary Tyrannosaurus rex look like a munchkin. At 76 tonnes, the plant-eating behemoth was as heavy as a space shuttle. The dinosaur’s fossils were found in southern Argentina in 2012. Researchers who examined and dated them said the long-necked creature was the biggest of a group of large dinosaurs called titanosaurs. “There was one small part of the family that went crazy on size,” said Diego Pol of the Egidio Feruglio paleontology museum in Argentina, co-author of the study published Tuesday in the journal Proceedings of the Royal Society B. 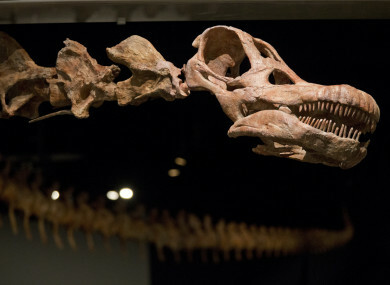 The researchers named the dinosaur Patagotitan mayorum after the Patagonia region where it was found and the Greek word titan, which means large. The second name honours a ranch family that hosted the researchers. Six fossils of the species were studied and dated to about 100 million years ago, based on ash found around them, Pol said. The dinosaur averaged 122 feet long and was nearly 20 feet high at the shoulder. A cast of the dinosaur’s skeleton is already on display at the American Museum of Natural History. It’s so big that the dinosaur’s head sticks out into a hallway at the New York museum . Scientists have known titanosaurs for a while, but this is a new species and even a new genus, which is a larger grouping, Pol said. Another titanosaur called Argentinosaurus was previously thought to be the largest. “Getting up. Walking around. Trying to run. It’s really challenging for large animals,” he said. buffet for these dinosaurs and they just got bigger. “It’s hard to argue this isn’t a big deal when it concerns the (probable) largest land animal ever discovered,” University of Maryland paleontologist Thomas Holtz, who wasn’t part of the study, said in an email. Email “A newly-found dinosaur makes the T-rex look tiny”. Feedback on “A newly-found dinosaur makes the T-rex look tiny”.